Start looking better with skin care systems for both men and women from our company in Houston, Texas. 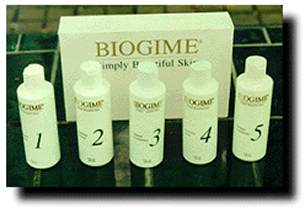 Biogime's products are designed to help you improve the health of your skin through 5 easy steps. Contact us at (855) 358-8274 for more information about making our skin care systems work for you. Personalized skin care -- for women. Five simple steps to healthy, attractive skin. and dead cells to the surface. step one and create the lathering creme. Personalized skin care -- for men. Four simple steps to healthy, attractive skin -- plus the added benefit of the smoothest, cleanest shave possible. step one and create the shaving creme. Your skin receives Vitamin A, D, and E with our 5-step skin care system designed for both women and men. The first step is a cleanser that removes makeup. The second step is a cleanser that lathers up and gets down to the pours to remove oil and dirt. The third step is a moisturizer that puts back in your skin the nutrients lost in the other steps. Step 4 is a toner spritzer for your skin, and the final step is a sealer that locks in your moisture and keeps out the oil and dirt from the environment. It is important not to rub or scrub the skin when you are prone to breakouts or acne. The cleansers provided in our skin care systems are self-activating, and a gentle touch is all that is necessary to get the results you want. * It's important not to rub or scrub the skin, especially if you experience breakouts or acne; this will only irritate the breakouts. The cleansers are self-activating and a gentle touch is all that is necessary. * It may not be necessary to use Step #5 in the Women's System twice a day; use it only where and when you feel you need it. Excellent for help with clogged pores. Draws out excess oil & heals breakouts. At times, it may appear that your skin is becoming drier due to flaking and occasional itchiness. In fact, this indicates that the dead cells are shedding away to reveal a "new set" of healthier cells underneath. We recommend that you use only a dot size of the cleanser during step 2 and mix it with 2 parts water. * At times it may appear that the skin is becoming drier because of the flaking and occasional itchy. In fact, this condition indicates that the dead cells are shedding away to reveal a "new set" of healthier cells underneath. * Use only the dot size of the cleanser show on the back of Step #2 and mix with 2 parts water. *You may add more Step #5 where and when you feel you need it. Rehydrates and softens the eye area. A gentle deep cleansing for clogged pores. For re-texturizing dry and dehydrated skin. Your twice-a-day maintenance program cleanses, conditions, and protects the skin without irritation. When using our skin care systems, just follow the simple instructions on the back of each bottle to get the results you deserve. *Always use gentle feather like strokes. * Use tepid water so as not to burn or shock the skin. * Adjust the amount of Step #5 using it where and when you feel it is needed. Contact us in Houston, Texas, Toll Free at (855) 358-8274 for more information about our skin care systems.